The Wandle’s a winner in Croydon! Before Christmas we urged you to vote for your favourite park in Croydon to be in with a chance of sharing the £1.5 million available. Four of these parks were along the River Wandle or its tributary the Norbury Brook and we are very pleased to say that all four were amongst the winners of the ‘Parks to be Proud of’ initiative! Wandle Park, Thornton Heath Recreation Ground, Norbury Park and Waddon Ponds are amongst nine parks to share the prize money, which is spent over and above ongoing programmes of general works and Croydon council will shortly be asking local people what they would like to see happen in these parks. 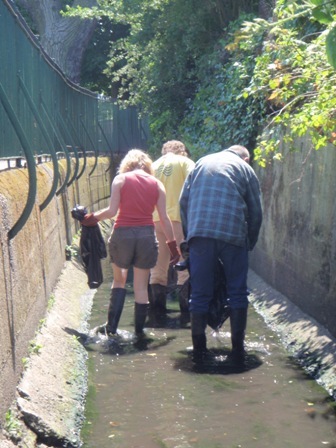 If you’re asked, please do think of the Wandle and Norbury Brook and how they might be improved, for example, by helping to bring the Wandle above ground through Wandle Park, or by restoring the Norbury Brook which currently runs in a concrete ditch alongside Thornton Heath Recreation Ground and underneath Norbury Park. This entry was posted in Uncategorized and tagged Planning, River restoration, Wandle on January 25, 2010 by Bella.